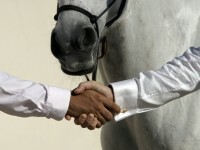 “Few ways are as deeply genuine as riding, working, and being with horses. Hoofbeatz does not just teach kids and adults a skill but discipline, self knowledge, courage, physical strength, fitness and all round authentic self-esteem. I loved the creative communication, the superior, complementary skills of all “teachers” ..the family oriented atmosphere at Hoofbeatz.. ..and of course the exceptional beauty and skill of the horses.” Eva Evans- California. (visited Hoofbeatz for a ten day course).